You get the following message when you try to open an already submitted InfoPath form – ‘The form cannot be opened because either signature is corrupt or the certificate used to sign the form expired or revoked’ when the certificate used to sign the form has expired or revoked. Even if you try to open the template you get similar message. 1. Get a new certificate from a certificate authority or you can use a self signed certificate (which will expire in 30 days). 2. Download the form template from SharePoint. It can be downloaded from form library or from Central Admin if the form is admin approved and deployed from central admin. 4. 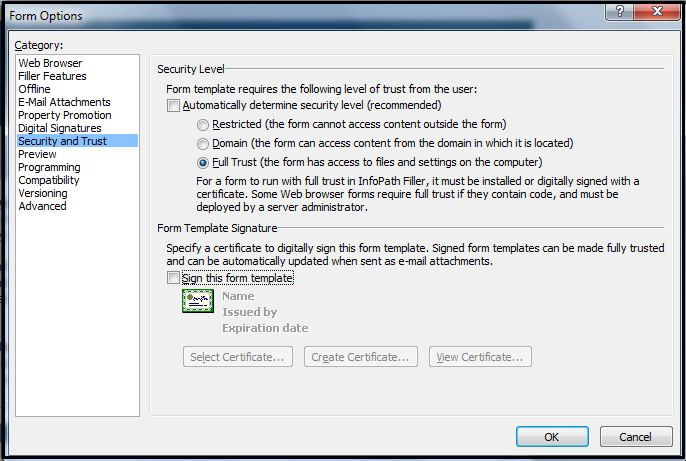 Click ‘OK‘ to remove the certificate and open the form. 6. Select ‘Security and Trust‘ under Category in left panel. Admin approved forms should be ‘Fully Trusted’ and a certificate should be used to sign the form. 7. Select ‘Sign this form template‘ option. Select the certificate which we got in Step 1. 8. Select ‘OK‘ and Save. Publish the form. 9. Upload the form again in Central Admin. 10. Disable and Enable the site collection feature. Make sure that the form template in site collection form template library is updated. 11. When the form is opened again, you need to trust the certificate and it downloads it to users machine. 12. If you don’t see the updated form or certificate. Try Clearing the InfoPath cache in users machine. Refer to this post for Clearing InfoPath cache. After completing all the steps, the Certificate used to sign the form is updated with a new cert and form is published.